← How Do They Know? I’m not a big fan of Halloween (click here to see happened two years ago) but I can’t say the same thing for my wife. While she doesn’t necessarily enjoy all the little beggars trick-or-treaters coming to our door, she does like all of the shopping leading up to the end of the month. Over the next week and a half she’ll find reasons to stop at Target on her way home, which means she’ll be coming home with bags of candy and boxes of her favorite cereal that can only be found during this time of the year. This is what she came home with last night. Gallery | This entry was posted in Daily Life and tagged daily life, food, halloween, humor, postaweek2012, shopping, Tammy. Bookmark the permalink. I LOVE HALLOWEEN. It’s better than Christmas. You get to dress up and scare everyone. It’s my goal to make all the little children scream in fear. You and Tammy should get all gory and bloody and traumatize all the little kids who knock at your door. It’s fun to hear them scream and eat THEIR candy. One year I put speakers in the yard, played scary music and Jake even hid in the bushes but… it was a lot of work. Plus Tammy doesn’t want to give people any more reasons to think we’re the white trash of the neighborhood. She often forgets about Camaro Boy (https://thelifeofjwo.com/2012/05/09/the-80s-called-and-wants-its-_____-_____-back/) and his cat stealing skanky wife (https://thelifeofjwo.com/2011/08/26/don%E2%80%99t-touch-my-wife%E2%80%99s-pssy/). 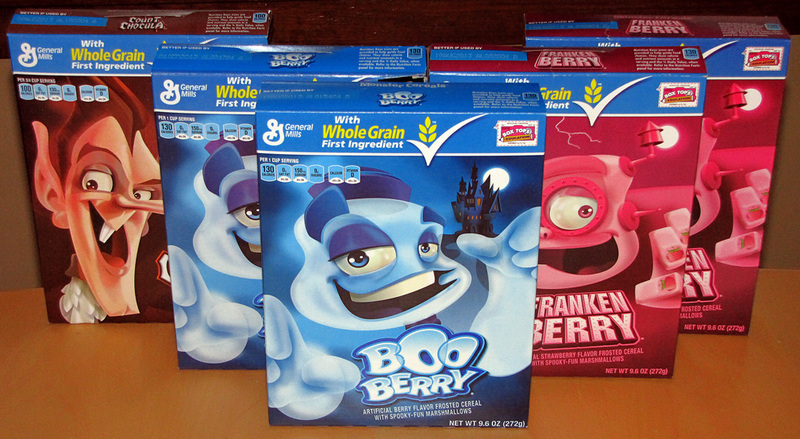 Trick or treat, smell my feet, those cereals are dangerously sweet. I never noticed they only sell them at Halloween. Didn’t they sell them year-round when we were kids? Tell Tammy to enjoy her cereal. Halloween comes but once a year. My husband’s favorite too!!! I’m wife of the year for bringing home a box of Franken Berry. Hahaha… Tammy brought home FOUR boxes for herself and ONE for me. Tammy: Yup. That’s how I roll.